An aural delight of excellently spirited Sibelius. (...) the total effect warrants my recommending this disc for Best of the Year honors. The way Kuusisto and the ensemble breathe together in the Humoresques, allowing real improvisatory freedom with no loss whatsoever of rhythmic coherence, is pretty amazing. (...) The engineering, whether in stereo or multichannel formats, is just as splendid as the performances. (...) Terrific! Enchanting (...). Sheer unbelievable nuances between naively cheerful elegance and spookily pale coolness. (...) A product to fall in love with - discretely but permanently. Kuusisto's lithe, pliable playing is matched by the Tapiola Sinfonietta's sensitivity in creating images that are enchanting and wonderfully evocative in equal measure. 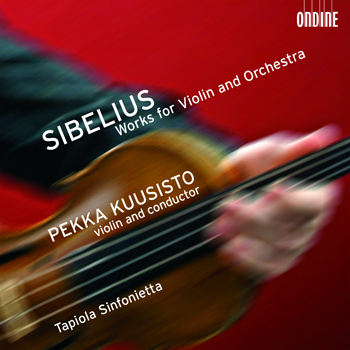 For lovers of Sibelius's famous Violin Concerto, this CD offers the ideal opportunity to discover his less-performed works for violin and orchestra, played by the celebrated Finnish violinist Pekka Kuusisto. Described by The Guardian as "absolutely mesmerising", Pekka Kuusisto is one of the most cutting-edge violinists of his generation who performs with the major orchestras in the world and is acclaimed for his tone, technique, infectious enthusiasm and his imaginative interpretations. He embarked on his international career in 1995 at the age of nineteen, when he became the first Finn to win the Sibelius Violin Competition. His début album, featuring Sibelius's Violin Concerto, earned gold status in Finland and the Music Industries Association Award for Excellence 1996 (ODE 878-2, or coupled with Sibelius's Complete Symphonies, ODE 1075-2Q). The Tapiola Sinfonietta is one of the top professional orchestras in the Nordic countries, famous for its fine performances of classical, contemporary and less-known chamber orchestra repertoire.